"This uncut-lime green makes a real fashion statement." You really need to look at this polish in the light to see it's true beauty. In normal lighting, this polish can look a bit meh - but on a sunny day it really comes to life! This green is a cool mix of mossy tones and bright lime notes, with an almost metallic finish. The formula was good and dried very quickly. I wore this polish for 4 days before I got a chip, which is very good for my nails. "Do Not Disturb…I’m enjoying this creamy, smooth pink." I love vanilla coke! Not sure what a pink polish has to do with Vanilla Coke, but I still love the polish. This pink has a creamy formula that builds up easily in two coats to a perfectly opaque finish. This polish doesn't dry to the shiniest finish ever, so you might want to add a top coat. "Glitter to the max in this juicy orange explosion!" You can really tell that this polish has a truly orange base once it's applied over a pink polish. One coat gave me a good amount of glitter, but I'm sure that a second coat would make the glitter a bit denser. I wouldn't choose to wear this glitter polish alone on bare nails, but it does look beautiful over a base colour. The gold and orange glitter pieces compliment each other well, and no fishing for glitters was required! The Coca-Cola by OPI Collection will be available in salons starting June 2014, and these are limited edition colours. I love all three shades, and going off of swatches that I've seen from the rest of the collection, you really can't go wrong with any of the polishes! 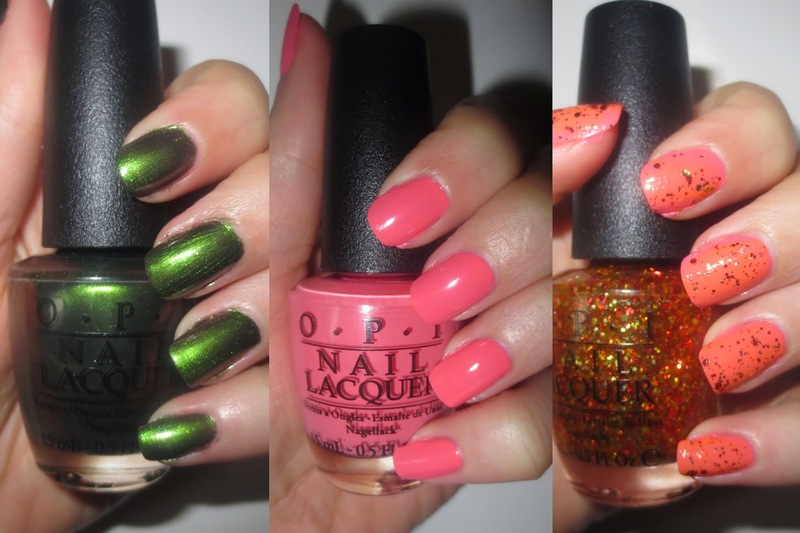 Are you interested in any of the polishes from OPI's new Coca-Cola Collection? your nails look great! that green one definitely has my attention. my polishes are slow arriving, i wonder what shades i'll get! Can't wait to see your swatches! My press releases says it's inspired by vanilla coke? I was confusing it with the Get Cherried Away one! Ohh kk no worries! The pink doesn't exactly resemble Vanilla Coke anyways! I am so thirsty for Vanilla or Cherry Coke now. I wish it was readily available here! Oh I had really high hopes for that glitter, it's too sparse for my liking. It's a good topper! But ya, you couldn't wear it on its' own. Thanks! Haha, I am too! I love the Sorry I'm Fizzy Today! So pretty! My heart goes out to Green on the Runway! I like that pink polish. I am a real diet coke addict. when i die, i'll be drinking DC. maybe i should cut back? on second thought, that won't be possible. the thought of drinking an ice cold DC on a hot day is too powerful. I really like that glitter layered over Orange You Fizzy! I need to layer my polishes more. Green on the Runway looks awesome! I don't drink a lot of Coke but I do like it over Pepsi.